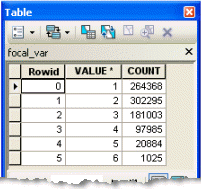 Calculating neighborhood statistics is useful for obtaining a value for each cell based on a specified neighborhood. For example, when examining ecosystem stability, it might be useful to obtain the variety of species for each neighborhood to identify the locations that are lacking variability in the distribution of species. For this data, you can calculate the number of different land-cover types in each neighborhood by specifying the Variety statistic for the Focal Statistics tool. 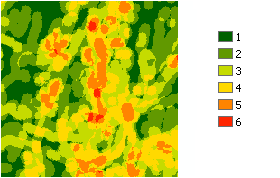 The values in the output raster are based on the cell values specified in the neighborhood. 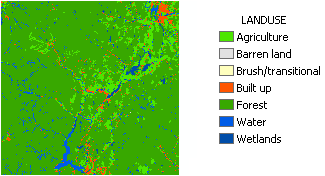 A quick overview of the region shows you the areas with more than one land cover. By zooming in on a particular area, you can see more clearly that there are neighborhoods with many types of land cover present. Zoom in to better see neighborhoods with greater variety. 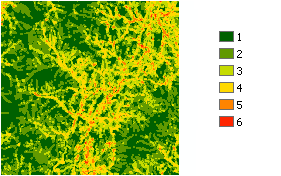 The attribute table for the output raster tells you how many cells there are that contain multiple types of land cover within the specified neighborhood.